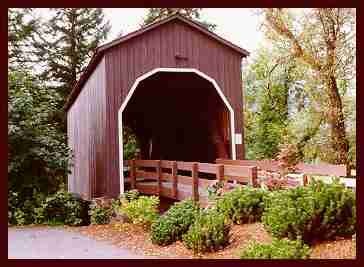 Oregon has the largest collection of historic bridges in the West. The Pass Creek covered bridge is one of 51 existing truss spans in the state. In addition to being one of the oldest bridges in Oregon, this is one of the few that is within city boundaries. The original bridge was built in the 1870’s as part of the overland stage route from Roseburg to Scottsburg. It was rebuilt in 1925, and part of the present truss may be hand-hewn timbers reused from the 1870 bridge. The roof was rebuilt in 1969 after damage from heavy snowfall. The bridge structure is a 61 foot housed Howe truss and is basically unchanged from the original appearance. The one land bridge is 19.5 feet wide and 30 feet high at the gable peak. Closed to vehicle traffic in 1981, the bridge was moved in late 1980’s to it’s present location behind the Drain Civic Center and Library.